Two weeks ago, I ran a marathon! 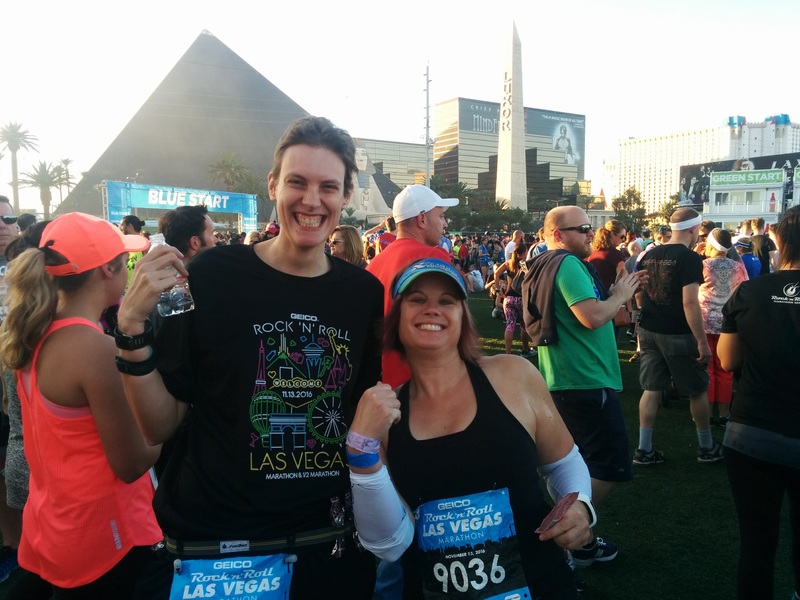 The Rock’n’Roll Las Vegas Marathon. 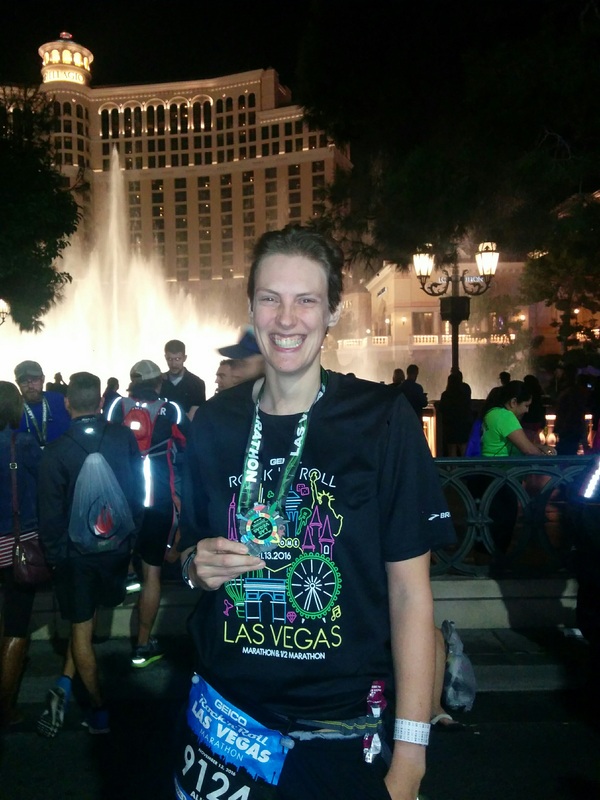 The race was in Las Vegas, so I traveled down there a few days before and stayed in a hotel on the strip, conveniently near the finish. I had signed up for the race some months earlier. #RunTheStripAtNight was the hashtag for the event and it had initially intrigued me. The course cutoff is five hours. I knew this was close for me, but I thought I would get faster with training over the summer. As it was, my summer training didn’t really go as planned and a couple of injuries severely restricted my running. I was therefore, rather concerned about my ability to finish this race within the prescribed time. For the uninitiated, a marathon is 26.2 miles, or 42.2km. To finish within my five hour goal I would need to average 7:06 minutes or less per kilometre. The first 10km went very well, I ran with my friend Emma (who had coincidentally also signed up for this race). The race started at 4:30pm and the route took us right down the fully closed strip, through the sea of neon lights and music to Fremont Street and old Vegas. Everything was going well and I had even built up a couple of minutes buffer for later. At about 16km, the marathon runners split off from the much larger half-marathon race and headed off to… nowhere. 20km of industrial estates and empty streets with the odd water station and a couple of music stations. I kept going, and going. I ran 10 minutes and walked for 1, and just kept repeating, over and over again. Finally, after innumerable out and backs and false horizons, we rejoined the strip at around kilometre 32. I began to believe that I could possibly do this. For the past four hours, I had been worrying nonstop about missing the cutoffs, but I was always just within time at each mile marker. I knew there was one more small out and back before the finish. At least it looked small on the map! Not only was it not as small as it looked, it took us around the perimeter of a very large empty lot, just as we approached the gate, the cones directed us back inside to do another lap…I could have cried, in fact I may have. Finally we were back on the strip. The home straight. I was definitely going to finish! That strip in deceptive; it felt like forever. Then suddenly, I was running past an erupting volcano – the Mirage hotel. I ran as fast as I could – which wasn’t very fast by now, and crossed the line. I wasn’t sure of my exact time, the clock having started with the first runner, whilst I started back in corral #9. Luckily Kay came to my rescue. Unbelievably she had been tracking me via the online livetracker for much of the past five hours and was able to confirm that I had a time of 4:56:55. Under five hours! I then fell into bed and spent the next two days almost unable to walk – do not skimp on the recovery kids! I’ve been tapering and recovering from the aforementioned marathon, so not too much to report on the training front, mostly just a little swimming. I was also able to take part in some coaching training with Cycling BC – Ready to Race which was a lot of fun. I will start the first block of training for Lanzarote this week, so my goal is to achieve consistency and work on my base fitness and strength.